See scan - perfect condition. this is na absolutely scarce and rare modern Bulgarian medal instituted by State and Government decree in 2000 and intended as to award heads of State, Foreign Ministers and other high ranking foreign officials who showed extreme merit and achievements in strengthening the diplomatic relations between their own countries and Bulgaria. 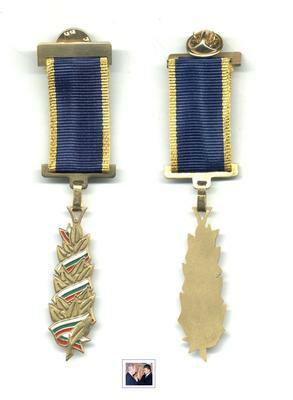 The Golden Laurel Branch is a scarce and extremely rare decoration of the Bulgarian Foreign Ministry and is being awarded by the Minister himself. Not more than 10 or 15 foreign officials had received this highest Bulgarian diplomatic decoration and some of them are the US Secretary of State Madeline Allbright and Israel's Shimon Peres during this year and awarded by Bulgarian Minister of Foreign Affairs Mr. Solomon Passy. Absolutely scarce collector piece and one of the rarest Bulgarian modern medals.